I’m pleased to re-announce a new Ruby Users Group for folks north of San Francisco (or who like to go to Sebastopol, CA): the North Bay Ruby Users Group. Our first meeting is this week; February 15th, 2007 at 7:00pm. O’Reilly has graciously offered us a place to meet, so we’ll be holding the meetings at O’Reilly HQ in Sebastopol, CA (directions). Meetings are on the third Thursday of each month. If you’re interested in learning more, please sign up for the mailing list. Our first meeting will feature Rob Orsini and myself, kicking things off by discussing how O’Reilly uses Ruby to make good things happen. Please RSVP on the mailing list so we know how much pizza to buy. We hope to seeing you there! I’m pleased to announce a new Ruby Users Group for folks north of San Francisco (or who like to go to Sebastopol, CA): the North Bay Ruby Users Group with a first meeting on February 15th, 2007 at 7:30pm 7:00pm. O’Reilly has graciously offered us their meeting space, so we’ll be holding the meetings at the office in Sebastopol, CA (directions). The initial schedule for meetings is the third Thursday of each month, but we can have a discussion about whether other times work better at the first meeting. If you’re interested in learning more, please sign up for the mailing list. 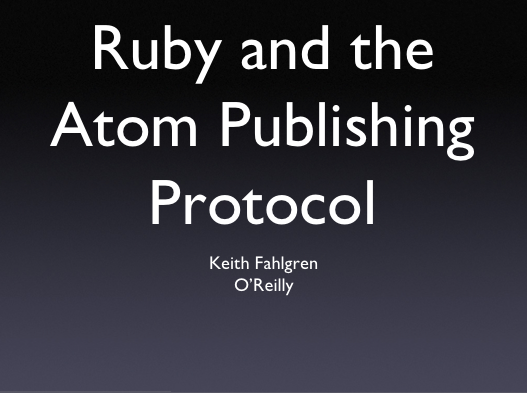 The agenda, as well as everything else, for the first meeting is still in flux, but Rob and I are planning to do a presentation on how O’Reilly uses Ruby internally, from small internal Rails sites to Atom Publishing Protocol libraries to XML processing. We can spend the rest of the time getting to know each other, eating pizza, and planning upcoming meetings. If you’d like to make a presentation at a future meeting or know someone who should, please join the mailing list and make suggestions (even if you can’t make it every month). PS: Yeah, the website is pretty crappy right now, we’ll be making it more useful in the coming days, adding a wiki and all that. For now, just be happy it isn’t this. You are currently browsing the archives for the nbrug category.